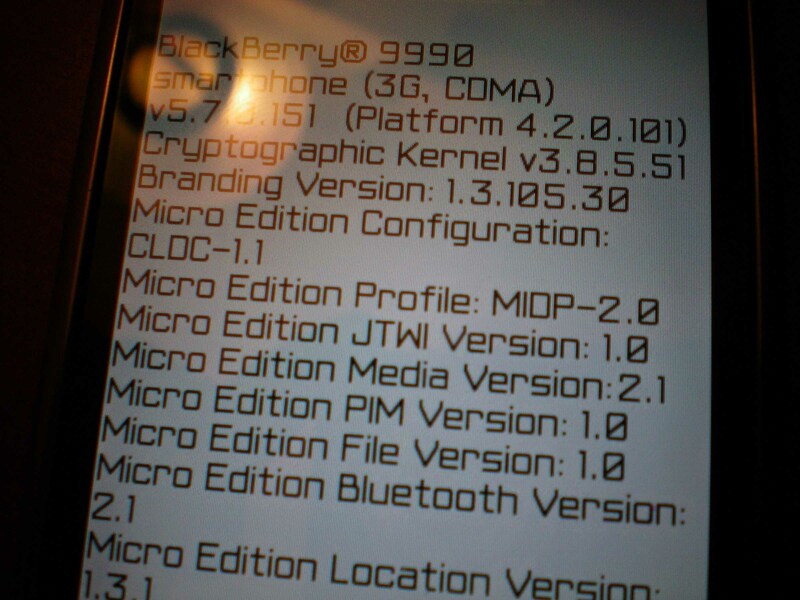 BlackBerry Storm 9990 Device Model Surfaces in Photo - New Device Model for Storm 2?? After doing some quick research (could be wrong), it appears that internally (to RIM) that the "9990" model number does actually exist but doesn't seem to point to a new device - rather it is classified as Storm 2 hardware. The 9990's 5.7 OS could be/should be experimental/newer firmware for the Storm 2 (which for a long time now has been referred to as the 9550), though at this time the 5.7 version number displayed is definitely new/unheard of by most, so we're not fully sure what the scoop is here. It seems unlikely that 5.7 software would ever be "released" anytime soon (5.0 is the next rollout and we've heard that 5.2 is the next iteration to becoming). We don't **think** the image is a photoshop at least, but who knows, stranger things have happened. It really wouldn't be that hard to do up a wallpaper like this and take a photo. 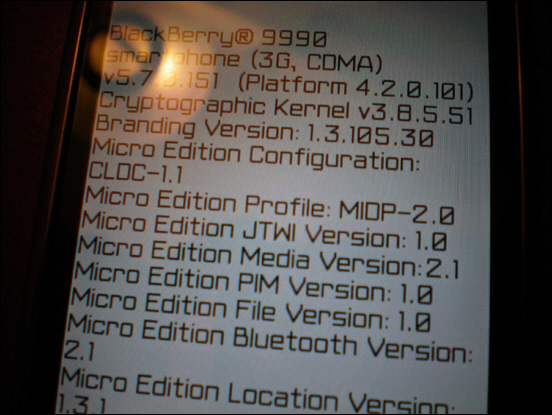 While version 5.7 software seems crazy, the fact images like this are not meant to be seen by the public (assuming it's a legit image of course) doesn't mean RIM could do some funky labeling on some internal test builds. Or, this could easily be BS. As said above, it's not news or rumor, but an interesting photo that showed up in the forums that we decided to post to the blogs to make for some discussion and there is some evidence that the 9990 is a model for the Storm 2. So what's this mean right now? Not much. The next-generation Storm is still a few months away from being released, and in the meantime a lot of work is being done on the firmware and things like device model numbers can change (but I wouldn't start calling the 9550 the 9990 just yet!). When I posted the video of the Storm 9550 in action the other week, which displayed an OS that was still in early stages, it was made clear to me that the final OS should be running smooth and offer up some enhancements not yet reflected in the firmware I was running (it seems there could be a bit more to the new touchscreen technology than initially meets the eye). I still owe y'all a follow-up Q&A post which is coming, but have been holding off on posting that for a bit (variety of reasons). Stay tuned. Have fun in the comments. Who calls photoshop? Who argues it's legit?